Traditional British scones served with clotted cream and jam, the finest afternoon tea time treats. Buttery, crumbly, and so flavourful. 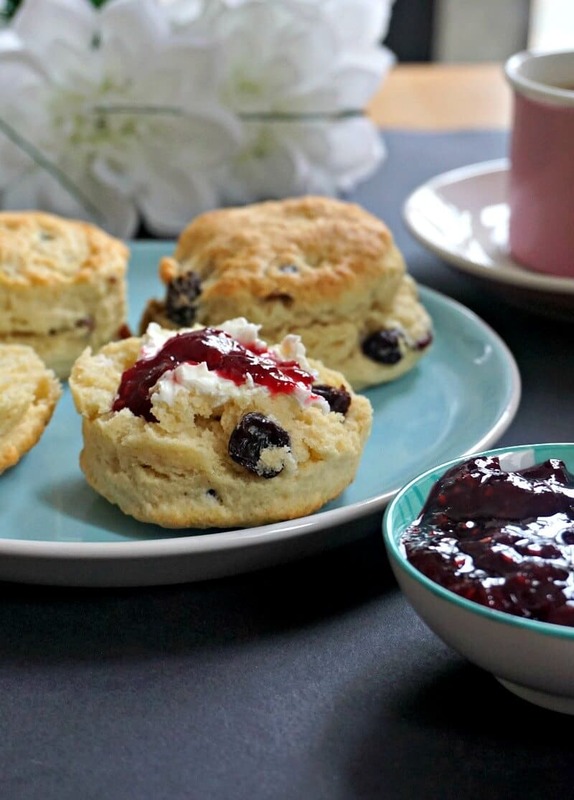 What would a true British tea time be without these mouthwatering scones? Heavenly rich and fluffy, hard to resist not having one too many. 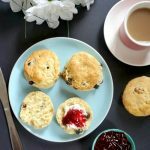 These scones are absolutely delicious; they are made from scratch in only 20 minutes, and the smell of freshly-baked goodies is pure heaven. To say that English people love scones is definitely an understatement. They are ever so popular all year round, and make for an excellent choice if you fancy a posh British afternoon tea. Or even a lovely breakfast. Butter them nicely, if you don’t have clotted cream, and there can’t be anything more indulgent. A proper treat, I’m telling you! Now, the English scones are quite different from the American version. They are closer in texture and shape with the American biscuits, while the term biscuits means crackers in the UK. Confusing much? Well, let’s just focus on the British scones for now. How do you make British scones from scratch? Nothing simpler. All we need is flour, baking powder, butter, milk, dried fruit of any kind, sugar, and some vanilla extract for extra flavour. Most recipes call for unsalted butter, but for my scones I used normal salted butter and they were just perfect. Perhaps it’s best to give both a try and see which one you like to use best with this recipe. add the dried fruit, milk, vanilla extract and sugar, and knead gently into a dough. Do not overmix though, we need the scones to be light and fluffy rather than dense. Just knead until the dough comes nicely together. Now, depending on the size of your cookie cutter, you can get more or less scones, the shape is not that important. I would, however, use the same size so the scones can bake at the same time. Are the English scones sweet or savoury? The authentic English scones are sweet, and are best served as part of a traditional cream tea. 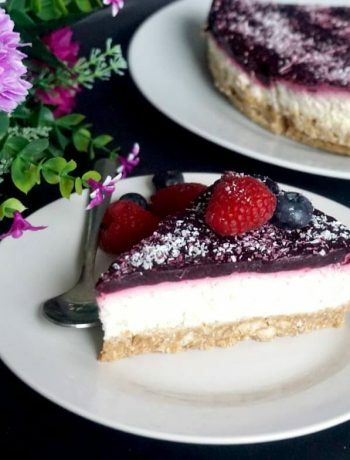 Now, they don’t need a huge amount of refined sugar added, since they are usually served with jam anyway, but it’s up to one’s taste how sweet they can be. I only added 3 tablespoons of granulated sugar, and, for my tastebuds, they were perfect. Especially that the dried currants are naturally sweet as well. 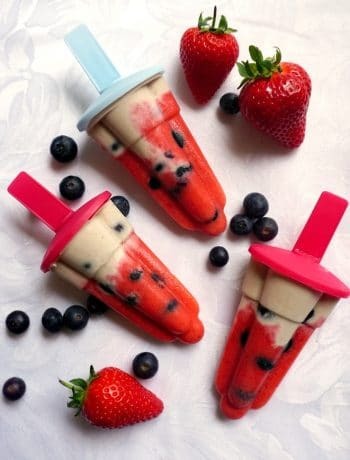 Increase the amount to 4 tablespoons if you’d rather have them sweeter. For some more traditional British treats, how about some delicious Strawberry and Cream Shortcakes? If you’ve liked my TRADITIONAL BRITISH SCONES or any other recipe on the blog then don’t forget to rate the recipe and let me know how you got on in the comments below, I love hearing from you! You can also FOLLOW ME on FACEBOOK, and PINTEREST to see more delicious food and what I’m getting up to. 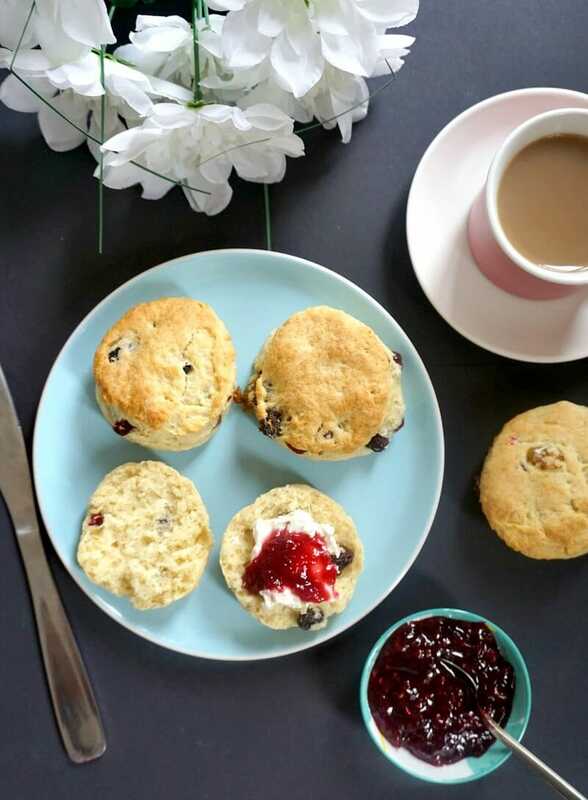 Traditional British scones served with clotted cream and jam, the finest tea time treats. Buttery, crumbly, and so flavourful. 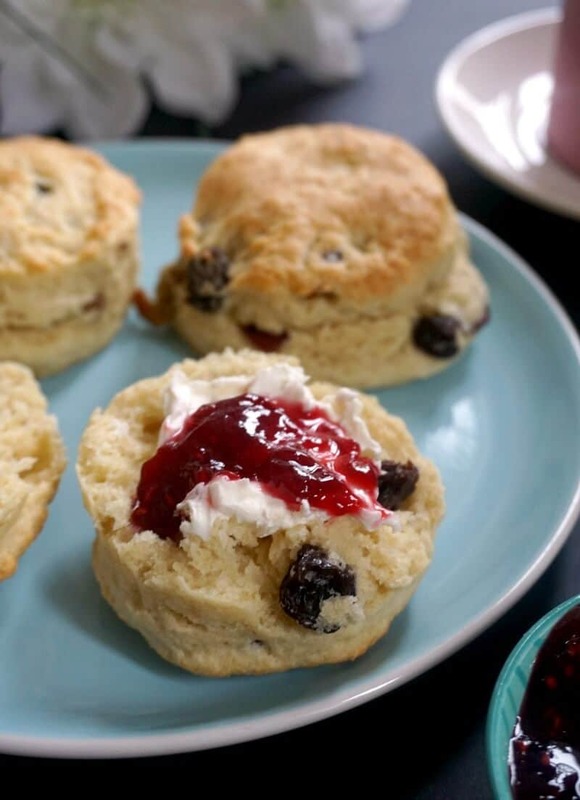 What would a true British tea time be without these mouthwatering scones? Heavenly rich and fluffy, hard to resist not having one too many. Sift the flour in a large bowl, add the baking powder and mix. Cut the butter into small cubes and rub them into the flour using your hands so that it resembles breadcrumbs. Add the milk to the dried ingredients. Add the caster sugar, vanilla extract and dried fruit. Using your hands, knead it into a dough. I find that the dough is so easy to work with, that there is no need to transfer it to the work surface, just slightly knead it into a ball. Roll the dough into about a cm or half an inch thickness, then use a cookie cutter to cut out 12 rounds. 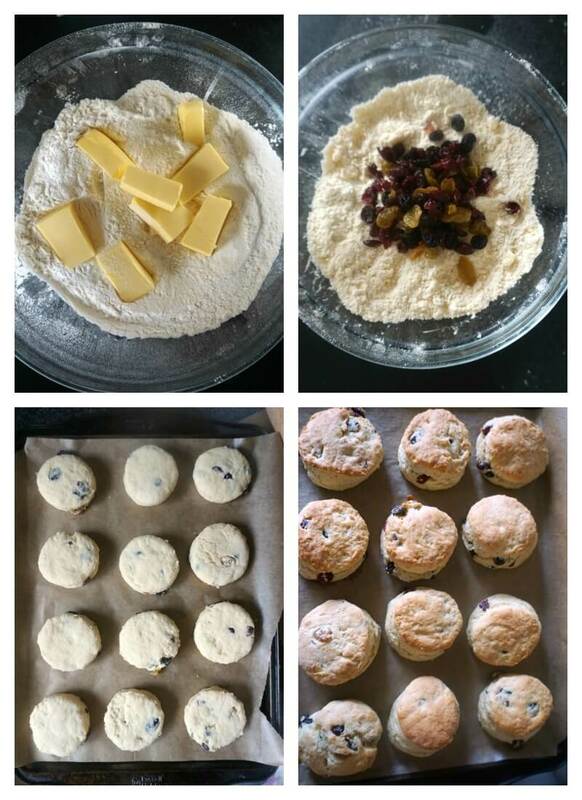 Line a baking tray with non-stick baking paper and bake the scones for 12-15 minutes until golden. Serve with jam and clotted cream or any other cream you like. Multumesc! O sa-ti placa mult, sunt foarte multe de vazut. Eu sunt in Anglia de 7 ani, nu stiu pe unde a trecut timpul. Just in time for a weekend breakfast!